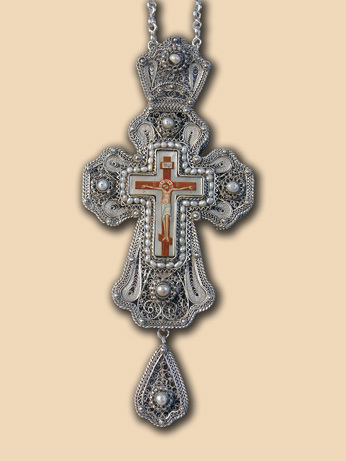 Bishop's pectoral cross in pair with panagia PN003, which can be seen HERE. Material: silver 950, fresh water pearls, mother of pearl. Technique: filigree, granulation, stone setting, icon-writing (Russian author, Moscow). 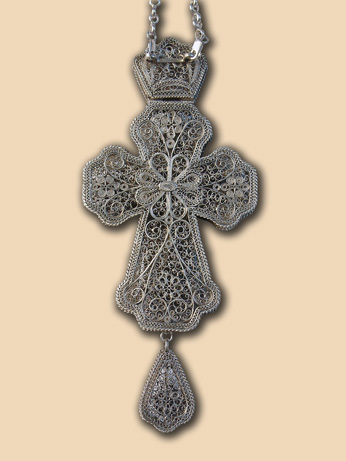 Size: cross 10×18 cm., chain 120 cm. Weight: cross 125 grams, chain 65 grams. Commissioned by: Father Vido Milic, Barejevo.